I am missing my sis a lot, so another page about her. I have quite a few of her done - and I would like to put a couple of albums together for my nieces, but none of the pages are flat - so can't seem to find any type of album that will work yet. 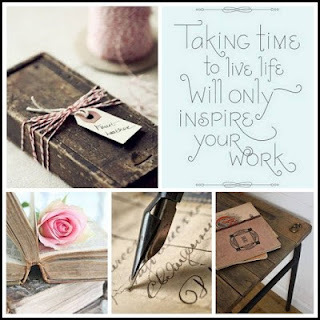 Paper: Bo Bunny Juliet: Nostalgia, Verona and Prose and Bo Bunny Noteworthy ephemera. Flowers: Prima: Aire Collection; Isabella Rosalia and Avante Berry and fussy cut some of the flowers from some of the Bo Bunny Juliet collection. Beautiful page Kathy. Lovely texture in the background. Great memory to keep. This is so beautiful, and such a worthy tribute to your sister, just stunning with those gorgeous papers and embellishments! Really beautiful LO Kathy!! 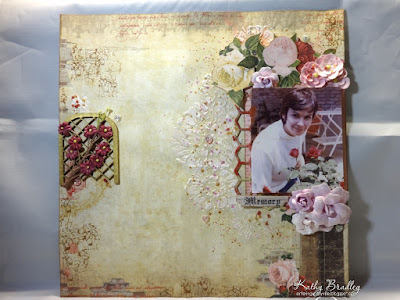 I love the soft vintage look and such a lovely way to preserve memories of your sis! Beautiful! I love the layers, you have made with flowers. Thank you for playing along with us at Scrap Around The World! Super cool composition ♥ Thank you for playing along with us at Scrap Around The World! This is soooo beautiful Kathy! What a stunning design. Have you looked at albums with ring clips inside (like school binders)? They can usually hold bulkier pages better and you can get some great designs. Thanks for joining in at SATW! Very beautiful page Kathy! Thank you so much for playing along with us again at SATW! !